Washington considers that Russian idea of a “sphere of influence” in Soviet successor states does not belong in 21st century. “Moscow has used the Armenian-Azerbaijani conflict over Nagorno-Karabakh to pressure both sides, maintain Armenia as an ally, and otherwise exercise regional influence”, -said Jim Nichol, American Specialist on Russian and Eurasian Affairs in the US Congressional Research Service’s last report on “Russian Political, Economic, and Security Issues and US Interests” issue. The report was prepared for Members and Committees of the Congress. The author reminds that, at the July 2009 summit, President Obama and Russian leaders discussed the frozen conflicts in South Caucasus, including Armenia-Azerbaijan conflict over Azerbaijan’s breakaway Nagorno-Karabakh region, and agreed to continue cooperative efforts to resolve the conflict. “The pursuit of these goals by then-President Putin and his closest policy advisors seemed to be driven by the belief that the West, and in particular the United States, had taken advantage of Russia’s political turmoil and overall weakness during the Yeltsin years. Putin and his advisors were determined to restore what they believed to be Russia’s rightful place as a significant influence on the world stage” the report says. The author also stated that, one of the Russia’s instruments on that region is energy pipelines. “Those concerned about the possible consequences of overdependence on Russia for energy have called for the building of pipelines circumventing Russian territory that would transport non- Russian gas supplies to Europe. The EU is supporting the creation of the Nabucco pipeline, which could have a capacity of 31 bcm per year. It would get its supplies from Azerbaijan and perhaps Turkmenistan through pipelines in Georgia and Turkey. Nabucco received a boost in July 2009, when Austria, Hungary, Romania, Bulgaria, and Turkey signed an intergovernmental agreement on the project. It is hoped that work on the pipeline could begin in 2012, with the first gas supplies available by 2015 and full capacity reached in 2019. While denying that Nabucco and South Stream are conflicting projects, Russian officials have cast doubt on Nabucco’s prospects, claiming that the gas supplies for such a pipeline may be difficult to find. Russia has attempted to buy up gas supplies in Azerbaijan and Turkmenistan, in what some analysts view as an attempt to undermine Nabucco. In order to build political support for South Stream, Russia has tried to entice key western European companies to participate in the project. It has also discussed the possibility of changing the route for the pipeline in order to play potential transit countries off against each other”. In the end, the analyst however mentioned that, according to some Russian public opinion polls, popular attitudes toward the United States have improved in recent months. “Hindutva’s Handmaiden”—Another Journalist Slain for His Work? He authored the much acclaimed book “Khaki and Ethnic Violence in India: Armed Forces, Police and Paramilitary During Communal Riots”. Its second edition, revised and enlarged edition came out in December 2009. His other book is Muslims in Indian Economy published in December 2005. "Omar Khalidi’s book fills a very large gap." says Dr AbuSaleh Shariff, Chief Economist and specialist in Human Development at National Council of Applied Economic Research (NCAER), New Delhi. What Justice Sharma was referring to was the ASI’s report of 2003 on Ayodhya of dubious value. What the ASI claimed to be the bases of pillars which held up the alleged temple turn out not to be pillar bases at all. The Siva shrine at a lower level adds no strength to the claim of a Ram temple. The terracotta from different levels has been so jumbled up that it can be linked to no particular stratum and period. Moreover, the presence of animal bones and glazed ware found at the site makes it difficult to claim that a Ram temple existed on this site between the XII and XVI centuries. These characteristics combined to form a traditionalist, location-driven excavation agenda that privileged some sites to the Hindus without regard to the historical provenance of any site or monument. Taken together, these characteristics privilege ancient references to monuments whether in legend or literature as authentic while all medieval and modern ones are perceived as tales of depredations. His student B.B. Lal (ASI director, 1968 to 1972) took up his advice. He excavated at Gangetic sites in search of evidence for the mythical periods described in the epics Mahabharata andRamayana identifying two kinds of pottery, Painted Grey Ware as an indicator of the former and Northern Black Polished Ware of the latter, and attempted to match archaeological sites with places named in the epics. The ASI used this “evidence,” to propagate the myth that underneath the sixteenth century Purana Qila built by Sher Shah Suri lay the site of Indraprastha, the mythical “Hindu” city. This spurious theory of Muslim rulers building over “Hindu” structures has certainly gained ground. By the 1990s, most publications about India’s capital describe Indraprastha as the first of the “seven cities of Delhi.” Lal used similar “evidence” at Ayodhya to support his claim of the identification of the god Rama’s birthplace, which was used as the justification for the demolition of Babri mosque in 1992. The story of Ayodhya became the prototype for the Hindutva gang’s claims on the innumerable mosques, mausoleums, dargahs, and Eidgahs, all to be reclaimed as former Hindu sites or temples. In ASI terminology, the term “Hindu,” is a catch all, homogenized category for all schools of Sanatana Dharma—Buddhism, Jainism, Shaivism, Shaktism, Vaishnavism and the rest. The ASI deploys such a convenient term to efface the long and bloody Hindu sectarian wars or Shaivite appropriation of Buddhist sites. The ASI’s methods serve to perpetuate the Hindutva groups’ myth of Muslim depredation of Indian heritage. The ASI has been looking for Hindu temple under every medieval monument. The unearthing of Jain idols in the vicinity of Fatehpur-Sikri in 1990s was the occasion to blame Emperor Akbar for destroying temples. When the annual meeting of the World Archaeological Congress in New Delhi coincided with the second anniversary of the Babri mosque demolition in December 1994, its two Indian organizers barred discussion of the event, since they were closely associated with the Ayodhya movement. In 2007, the ASI cooked up history at the Chittorgarh, Rajasthan fort by signposting an underground passage as the location of Padmini’s jauhar, self immolation, based on myth to highlight Emperor Alauddin Khilji’s alleged atrocities. Numerous modern temples abound the medieval fort. In 2003, the ASI virtually converted the 15th century Kamal Maula mosque in Dhar, Madhya Pradesh into a temple by allowing Hindu worship in it. Since 1977, the ASI has allowed construction of three brand new Hindu temples in the precincts of Sher Shah Suri’s mausoleum in Sasaram, Bihar. These bath-room tiled temples with their calendar-art frescos mar the magnificent mausoleum’s vistas. In 1970, the ASI allowed a kum-kum sprinkled stone on the southeast corner of Charminar in Hyderabad to be converted into a full-fledged Bhagya Laxmi temple. A modern temple is protruding out of a major medieval monument in defiance of ASI’s own rules. At the turn of the twenty-first century, almost all the grand gates in historic Golconda fort and Hyderabad are riddled with Hindu temples, signs and icons flying in the face of the ASI’s preservation mission. In the 1948, the ASI converted the Jama Masjid in the Daulatabad fort in the Deccan into a Bharata Mata (“Mother India”) Temple. The very name is so candidly, crassly contemporary as to make a mockery of a medieval site to be so named. These examples of the ASI’s interventions in various geographic areas of India are symptomatic of numerous examples that establish its role as the handmaiden of Hindutva. The ASI’s representation of India’s archaeological legacy in Hindu terms has had a direct impact on heritage tourism. Unlike eco-tourism, medical tourism and the like, heritage tourism has vast appeal to the increasingly rich, upwardly mobile, tech savvy upper caste Hindus at home and abroad. The ASI’s representation of Indian archaeological sites as essentially Hindu is also reflected in the websites and printed tourist guides and promotional literature. Indian tourism ministry’s and state tourism departments privilege India’s Hindu past whereas the Muslim period is elided. Such representations of India as “Hindu,” is implicit though not explicit in the “Incredible India,” promotion directed toward the diaspora in North America, Europe, and wherever the rich live. When tourists come to the sites and monuments, they learn that these are Hindu sites pillaged by Muslim depredations. To anyone who has been a tourist in India, the various self-appointed touts and guides at the sites are ubiquitous. They provide a spicy supplement to the official narrative of Muslim vandalism. The wide appeal of Hindutva among the Indian diaspora can be partly explained by their experiences at the sites of tourism. The ASI and the official tourism bureaus’ characterization of Indian archaeological sites as the foci of Muslim vandalism reinforces what was learnt through biased textbooks. The growing Islamophobia in the west further adds to the mental images of Muslims as violent bigots. As India reinvents itself through archaeology and tourism, official organizations such as the ASI, the state archaeology departments and tourism bureaus lend themselves as the handmaidens of Hindutva, even if they don’t mean to do so. Omar Khalidi is an independent scholar and a staff member of the Massachusetts Institute of Technology, Cambridge, Massachusetts, USA. 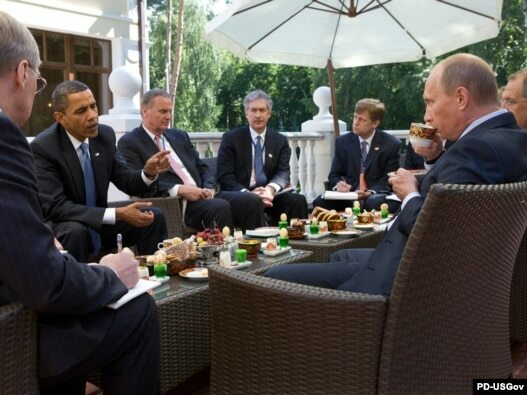 U.S. President Barack Obama (second from left) and Russian Prime Minister Vladimir Putin (right) meet at the latter’s country residence outside Moscow in July 2009. The United States considers Prime Minister Vladimir Putin to be Russia’s true ruler despite the close relationship and public camaraderie that has developed between Presidents Barack Obama and Dmitry Medvedev. In leaked U.S. diplomatic cables released by the whistle-blowing website WikiLeaks, officials describe Medvedev as "pale and hesitant," a sharp contrast to their portrayal of Putin as an "alpha dog." The cables also note that Medvedev — the country’s nominal ruler — appears to play "Robin to Putin’s Batman." In another cable describing a meeting between U.S. Defense Secretary Robert Gates and French Defense Minister Herve Morin in February, Gates is quoted as saying that "Russian democracy has disappeared and the government was an oligarchy run by the security services." Excerpts from the cables were published by the newspapers "The New York Times" in the United States, "The Guardian" in Great Britain, "Der Spiegel" in Germany, France’s "Le Monde," and Spain’s "El Pais." Analysts say the classified documents illustrate that despite the noticeably warmer relationship that has evolved between Washington and Moscow since Obama announced his reset policy, the U.S. foreign-policy establishment harbors few illusions about the nature of Russian domestic politics and Kremlin’s international intentions. "It shows that there is this cold, steely-eyed realism about Russia," says Nikolas Gvosdev, a professor at the U.S. Navy War College and author of the former "The Washington Realist" blog who writes for "World Politics Review." "They are not taken in by the rhetoric about managed democracy and managed pluralism. In private they recognize it for what it is, an oligarchy run by the security services and this informs their policy towards Russia." This was clear from the cable describing Gates’ meeting with Morin, in which the defense secretary tried to convince the French not to sell Mistral-class warships to Russia, a prospect that alarmed neighboring Georgia and others. Gates told Morin that such a move would send "a mixed signal to both Russia and our Central and Eastern European allies." According to the correspondence, Gates also said Medvedev "has a more pragmatic vision for Russia than Putin, but there has been little real change." In another cable, an unidentified U.S. diplomat described Putin’s problems struggling with an unmanageable bureaucracy and ruling a "virtual mafia state." Gvosdev says the disclosures show that the administration does not "assume greater virtue" on the part of the Russians, even as it tries to work with Moscow. "What they have always grappled with is: given the realities, what do we do about it?" Gvosdev says. "They never really fell into this approach with Russia that there are these problems and we ought to fix them. Their approach is: we’ve been dealt the hand we’ve been dealt and these are the people we are dealing with. But let’s try to extract whatever value we can from the relationship." Since Obama initiated his "reset" policy with Russia shortly after taking office last year, Eastern European officials have repeatedly expressed fears that their interests would be sacrificed on the altar of better relations between Moscow and Washington. Domestic critics have also slammed the policy as a naive capitulation to Moscow. The leaked cables appear to show, however, that the administration harbors few illusions about Russia. Among the elite in Moscow, the gap between Obama’s friendly public posture toward Russia and the ice-cold assessment that emerged private communications among diplomats came as no surprise. "In Russia the public and the political elite are much more cynical and realistic than in Western countries. So the fact that diplomats say one thing [in public] and wrote something else [in cables] is in no way unexpected," says political analyst Fyodor Lukyanov, editor-in-chief of the Moscow-based policy journal "Russia in Global Affairs." Lukyanov adds that it stands to reason that the Obama administration would ruthlessly pursue American interests even as it sought improved relations and greater cooperation with Moscow. "We always thought that the Americans were playing a much more cunning game," he says. "In Russia nobody thinks Obama lacks an understanding of our country. He just thinks long-term and has his own priorities." The candid revelations in the cables come at a particularly crucial juncture in Russia’s relations with the West, and with the United States in particular. At NATO’s recent summit in Lisbon, Russia and the trans-Atlantic alliance agreed to cooperate in a number of areas, including a new missile-defense system championed by Obama. Russia has also agreed to allow NATO to transport nonlethal military equipment across its territory to Afghanistan. Moscow has also joined Washington in imposing sanctions against Iran in an effort to curb Tehran’s nuclear ambitions. Analysts say it is doubtful that the warming trend between Moscow and the West will be harmed by the WikiLeaks disclosures. "Everybody understands that people use language freely in closed diplomatic cables. It is unpleasant. But since the United States honestly warned that this was coming, there is no reason to get stressed out over this," Moscow-based political analyst Dmitry Oreshkin tells RFE/RL’s Russian Service. "Are we going to claim that our president is actually Batman himself and not just Batman’s assistant? Or that Putin isn’t really an alpha dog but rather a beta dog? This is just not that interesting." One thing that could damage the reset, however, would be Obama’s inability to get a reluctant Senate to ratify the new START nuclear-arms control treaty that he signed with Medvedev in Prague in April. "I don’t think this [the WikiLeaks documents] will harm the reset by itself. But the reset will have its own problems if the new START treaty isn’t ratified," Lukyanov says. "This would raise a lot of questions about what happens next [in U.S.-Russian relations]." A tribesman loyal to the Bugti clan, leaders of an insurgency seeking autonomy for Balochistan Tribesmen loyal to the Bugti clan which is seeking autonomy for the Pakistani province of Balochistan. WikiLeaks cables show Afghanistan has been sheltering their leader Brahamdagh Bugti. Afghanistan’s president, Hamid Karzai, has been sheltering a Pakistani rebel for several years, much to the annoyance of Pakistan’s generals, US embassy cables show. A stream of Pakistani demands for Bugti’s return are stonewalled by Karzai; Bugti is accused of kidnapping a senior UN official; and the Islamabad CIA station chief is roped into an initiative to move Bugti to Ireland that turns out to be based on a false promise. Bugti’s case was a “neuralgic” one for Pakistani generals, Americans believed. The Bugtis are at the forefront of a rebellion that seeks greater economic and political autonomy for Balochistan, Pakistan’s largest but least developed province. In 2007, General Pervez Musharraf said Bugti was “enjoying freedom of movement to commute between Kabul and Kandahar, raising money and planning operations against Pakistani security forces”. The controversy touches on one of the Pakistani military’s core fears: that India could use Afghan-based proxy forces to foment upheaval in Pakistan. In 2007 Musharraf said he had “ample proof” of Indian and Afghan support for Bugti; the prime minister, Shaukat Aziz, said Bugti had travelled to Delhi on a fake Afghan passport. American analysis suggests the fear of Indian meddling helps explain Pakistan’s support for militant proxies such as the Afghan Taliban; a view supported by a veiled threat Musharraf issued through a US diplomat. “If India wants to continue, let’s see what our options will be,” he reportedly said. Karzai, meanwhile, has refused to bend to Pakistani demands to surrender Bugti, accusing Islamabad of using the issue to deflect attention from its support of the Taliban. “Fomenting uprising does not make one a terrorist,” he said in one meeting before asking US officials to stop taking notes because the matter was “too sensitive”. In public, Afghan officials have consistently denied sheltering Bugti, but in a meeting with a senior UN official in February 2009, Karzai “finally admitted that Brahamdagh Bugti was in Kabul”, the cables recorded. The admission followed the kidnapping of a senior American UN official, John Solecki, in Balochistan. After Solecki was snatched from Quetta, Balochistan’s capital, in early February, Pakistan’s army chief, General Ashfaq Kayani, told the US he had phone intercepts that proved Bugti had orchestrated the kidnapping. Solecki was released on 4 April in Balochistan. Speaking to the Guardian by phone later that year, Bugti denied any role in the kidnapping, but admitted he was leading the fight against Pakistan’s army. “We want ownership of our own resources, our land, our coastal belt – nothing else,” he said. “We want to solve this problem politically; nobody wants to use the gun. But because of what is happening the armed struggle is necessary.” Bugti declined to say where he was speaking from. Bugti supporters say he is under tight Pakistani surveillance in Kabul and so, fearing for his life, they tried to move him to safer exile last December, the cables showed. In Islamabad, one of Bugti’s unclestold US and UN officials that the “deputy prime minister” of Ireland had unofficially agreed to grant Bugti asylum. This information triggered a meeting between a senior UN official and the US ambassador. Subsequently the CIA station chief met with the head of Pakistan’s intelligence service (ISI), General Shuja Pasha, to discuss the matter. But Pasha blocked the initiative, saying Bugti should be forced to “return to Pakistan to stand trial for his crimes”, and the US and UN dropped the idea. “While getting Bugti out of Afghanistan is still a good idea, we do not believe UNHCR should be involved,” the cable noted, referring to the UN refugee agency. The substantial, if publicly underplayed, US strategic interest in Balochistan is reflected in the number of cables on the province. Balochistan contains vast and largely untapped mineral resources, Taliban training camps, and is a major route for US military supplies being trucked into Afghanistan, second only to the Khyber Pass. Balochistan is also home to a secretive desert airstrip used by the CIA to launch drone attacks on al-Qaida and Taliban targets in the tribal belt. By removing Bugti from Afghanistan US officials believe they could remove an “irritant” in Pakistan-Afghanistan relations. They also fear he could be traded against other militants of greater interest. Last February, after the arrest of the senior Taliban leader Mullah Barader in Karachi, US diplomats said to “watch out for consideration of some type of exchange of Barader with Bugti”. But Barader remains in Pakistani custody and Bugti may no longer be in Afghanistan. A senior western official in Islamabad said the rebel had applied for asylum in France, which was refused, and in Norway, where the application was pending. A senior UN official said Bugti was sheltering in the United Arab Emirates; a human rights official said he sometimes travels to Geneva. Also, the diplomats said, Pakistan’s military chiefs – Kayani and Pasha – would be reluctant to lose a “huge potential propaganda pawn in Barader”. The cable said that while Bugti may be a core issue at some political level, the “truths Barader could tell about ISI not to mention a host of other Pakistani notables, likely outweigh any potential wins in bringing Bugti to Pakistani justice”. The allegations appear to be accurate. In a January 2007 meeting with assistant secretary of state Richard Boucher, [id:93284] Karzai said that mjore than 200 Bugtis had fled Pakistan into Afghanistan. He had advised them to seek asylum with the UN but many were frightened and had gone into hiding. Karzai said that Bugti was not a terrorist, saying that “fomenting uprising does not make one a terrorist”, then signaled that the issue was “too sensitive” and asked that note-taking be suspended. Two years later, in February 2009, Karzai confirmed to UN officials that Bugti was hiding in Kabul[id:192891]. The tone about Bugti changed under the current government. In January 2009 President Asif Ali Zardari said he would ask Karachi to “keep him in Afghanistan”, added that he was drafting legislation to give Baloch greater autonomy. The US ambassador said she preferred for the kidnappers to cross the border into Afghanistan “where the US had more assets” rather than attempt a risky rescue operation in Pakistan. Pakistani officials concurred and the ISI agreed to allow them cross the border. In order to comprehend the ostensibly bizarre Wikileaks phenomena that is continually in the news these days, it is essential to first comprehend the concept of the ‘Mighty Wurlitzer’. Therefore, today, I use the term ‘Mighty Wurlitzer’ as a metaphor to pluralistically refer to the same message-machine, i.e., the intelligence apparatus for manufacturing consent and controlling dissent, and its concomitant conscious manipulation of peoples’ thoughts, feelings, actions and in-actions, in order to serve the primacy interests of the ruling-elite. The latter are, invariably, also the de facto owners of the complete messaging-system now even more globally ubiquitous than when Frank Wisner played the world for a fool. This ‘grand organ’ is now able to even more effectively synthesize, implant, and reinforce, all the right set of beliefs (myths) among the entire world’s public – by suitably combining ‘events’ with imaginative ‘expos’ writing – which appropriately primes the world populations to acquiesce to the oligarchic agendas. While playing this orchestra is now an integral part of all state-craft, its major musical themes are entirely determined by the behind the scenes owners of the system. While some might refer to the underlying techniques as propaganda and psy-ops, ‘Mighty Wurlitzer’ singularly captures the messaging-system controlled under a unified purpose of command which is both highly compartmentalized and cellularized. Only the Mighty Wurlitzer knows the entire tune. The Mighty Wurlitzer operates on the core premise which has been empirically shown to psychologically motivate most human action. That premise was elegantly captured in the following insightful observation made at the so called “Terrorism Study Group”, that “’Public Assumptions’ Shape Views of History: Such presumptions are beliefs (1) thought to be true (although not necessarily known to be true with certainty), and (2) shared in common within the relevant political community. The sources for such presumptions are both personal (from direct experience) and vicarious (from books, movies, and myths).” Successfully implanting such presumptions and pre-suppositions among any group is to motivate its overall actions in accordance with those implanted beliefs. Thus, many intelligent peoples for whom it is otherwise inexplicable to understand why they persist in ‘United We Stand’ with absurdities, are motivated to react sympathetically to those absurdities. ‘There is another category of writer and self-proclaimed authority on the subjects of secrecy, intelligence, and containment. This man is the suave, professional parasite who gains a reputation as a real reporter by disseminating the scraps and “Golden Apples” thrown to him by the great men who use him. This writer seldom knows and rarely cares that many of the scraps from which he draws his material have been planted, that they are controlled leaks, and that he is being used, and glorified as he is being used, by the inside secret intelligence community. Allen Dulles had a penchant for cultivating a number of such writers with big names and inviting them to his table for a medieval style luncheon in that great room across the hall from his own offices in the old CIA headquarters on the hill overlooking Foggy Bottom. Here, he would discuss openly and all too freely the same subjects that only hours before had been carefully discussed in the secret inner chambers of the operational side of that quiet Agency. In the hands of Allen Dulles, “secrecy” was simply a chameleon device to be used as he saw fit and to be applied to lesser men according to his schemes. It is quite fantastic to find people like Daniel Ellsberg being charged with leaking official secrets simply because the label on the piece of paper said “top secret,” when the substance of many of the words written on those same papers was patently untrue and no more than a cover story. Except for the fact that they were official lies, these papers had no basis in fact, and therefore no basis to be graded top secret or any other degree of classification. Allen Dulles would tell similar cover stories to his coterie of writers, and not long thereafter they would appear in print in some of the most prestigious papers and magazines in the country, totally unclassified, and of course, cleverly untrue. Coldly implicit in Col. Prouty’s afore-quoted empirical statement: “and the hope that in time researchers, students, and historians will be able to ferret out truth from untruth, real from unreal, and story from cover story is at best a very slim one”, is the Machiavellian notion of sewing faits accomplis in current affairs by straight-jacketing all public discourse in deception, and leaving the ferreting out of ‘truth’ to future generation of scholars and historians when separating myths from the calculus of hegemony can at best only be a bogus academic exercise entirely irrelevant to reversing the faits accomplis already sewn. See Convince People of Absurdities and get them Acquiescing to Atrocities: The Enduring Power of Machiavellian Political Science. A pertinent example of Col. Fletcher Prouty’s fabricated leaks noted above, is the Wikileaks’ July 2010 disclosures of ‘The Afghanistan Papers’ which revealed nothing new. Wikileaks has always been a rather transparent Mighty Wurlitzer ops. It is trivial to see through the absurdity of its existence despite it promoting itself as being a sort of watchdog upon the empire, and therefore, ostensibly, being inimical to its unbridled quest for “full spectrum dominance” – just like Al Jazeera television based in Qatar, which too, absurdly enough, is permitted to function unhindered in the same nation as America’s CENTCOM headquarters. Would it not be trivial for an armed to the teeth National Security State to take-out either apparatus rather trivially? The reason each is allowed to function is of course social engineering, the sine qua non for waging modern warfare upon civilian populations by way of deception. It spans the entire gamut of engineering consent, from mantra creation in the mainstream and diabolically controlling dissent in order to control all opposition, to actually fabricating the visible pretexts which can naturally ripen the conditions for the mantra of “clash of civilizations” to be called real before the Western public in order to sustain the otherwise untenable “imperial mobilization”. Zbigniew Brzezinski had most succinctly summed this motivation in his book The Grand Chessboard – American Primacy and Its Geostrategic Imperatives: “Democracy is inimical to imperial mobilization”. As daunting as it might appear to the mainstream television watcher, it is in fact rather straightforward for those unencumbered by blind faith in governments and its statecraft. Just look for the core-lies and unquestioned axioms of empire that are typically retained in the “leaks” and reportage which, in order to sound credible, often openly expose what is mostly already known anyway or judiciously employ some variation of “Limited Hangout” wrapped in a veneer of dissent or ‘freedom of the press’. It’s the exact same recipe as is used by all the other fabricated and controlled dissent assets of empire when they are not outright spinning patent lies, for spinning half-truths requires far more brilliance. It is not for nothing that James Jesus Angleton, Head of CIA Counter Intelligence 1954-1974, is quoted in the 1992 BBC-2 Documentary on Operation Gladio: “Deception is a state of mind and the mind of the State”. [INSET] Osama bin Laden is alive and playing a key role in directing the war in Afghanistan, leaked US military files suggest. Multiple intelligence reports on the whereabouts of the al-Qaeda leader are contained among the documents. They disclose publicly for the first time that bin Laden is thought to be personally overseeing the work of suicide bombers and the makers of Taliban roadside bombs which have had a devastating effect on British and US troops. A secret “threat report” drafted by the Nato-led International Security Assistance Force (Isaf) in 2006 locates bin Laden as well as the Taliban leader Mullah Omar to the Pakistani city of Quetta as well as several villages on the Afghan border. — UK Telegraph 27 July 2010. The core-lies retained in the Wikileaks’ disclosure – which I call ‘the Afghanistan Papers’ – is to once again reaffirm that there is a real nemesis called “Osama Bin Laden”, that the “war on terror” is real, that it is being inflicted upon the West from Pakistan-Iran nexus, and to re-substantiate the handoff of former President George W. Bush’s clairvoyance to the Obama Administration that “If another September 11 style attack is being planned, it probably is being plotted in Pakistan, and not Afghanistan”! That, when such a “planned” attack transpires, it “will make Sept. 11 pale by comparison”. See: ‘Bin Laden’: Key enabler of “imperial mobilization” and nuclear attack on Iran-Pakistan. [INSET] ‘I am aware that there is still some who would question, or even justify the offense of 911. What would it matter afterwards, after Iran and Pakistan have been bombed, what were lies and what was truth? Did the bogus mea culpa by the 2005 Presidential Commission on intelligence failure, the Iraq Study Group’s disingenuous conclusion: “We conclude that the intelligence community was dead wrong in almost all of its prewar judgments about Iraq’s weapons of mass destruction. This was a major intelligence failure,” reverse the decimation of Iraq? Did the New York Times 2008 revelation of Pentagon’s Message Machine after ‘all the barbers in town already knew it’, return back to its silos each and every cruise missile that was dropped upon the innocent civilians of Iraq? Those attempting to see through its fog of deception when a fait accompli can still be averted – before missiles have left their silos, before pen has been put to legalisms – are variously labeled as ‘kooks’, ‘conspiracy theorists’, ‘delusional’, ‘denier‘, etc., their efforts infiltrated (as in cointelpro) and energies defocussed by introducing what’s cynically called “beneficial cognitive diversity”. See Anatomy of Conspiracy Theory. There is an undeniable categorical imperative before the Western peoples today. With the escalating belligerence towards Iran and the strategic dismantling of Pakistan palpably on the visible horizon, will the profoundly innocent of knowledge in the West allow themselves to be fooled once again into more criminal aggression upon civilian populations in the name of ‘War on Terror’? This perpetual ‘War on Terror’ is not about ‘Islamofascism’ – Please get with the real agenda you people! Or, will the people choose to not be (willingly) deceived by the Mighty Wurlitzer’s many ruses at every level which continually justify the core axioms of “imperial mobilization” by way of deception? (Reuters) – Prime Minister Vladimir Putin told CNN television thatRussia would deploy nuclear weapons and "strike forces" if it were shut out of a Western missile shield, adding punch to a warning from President Dmitry Medvedev. In an interview with Larry King taped on Tuesday, Putin said missile threats against Europe must be tackled jointly — a reference to an agreement reached at a Russia-NATO summit this month to cooperate on missile defense. But if Russia’s proposals are rejected and Western missile defense installations create "additional threats" near its borders, "Russia will have to ensure its own security," Putin said. Russia would "put in place new strike forces … against the new threats which will have been created along our borders," he said, according the English translation in an excerpt posted on the CNN website. "New missile, nuclear technologies will be put in place," he added. Putin said Russia was not threatening the West, but the remarks underscored the Kremlin’s insistence on a significant role in a missile defense system and suggested improving ties could sour again if agreement is not reached. In his state of the nation address on Tuesday, Medvedev warned that a new arms race would erupt if U.S. and NATO offers of cooperation on missile defense failed to produce a concrete agreement within a decade. "That’s not our choice, we don’t want that to happen. This is no threat on our part," Putin said. We’ve been simply saying that this is what all of us expect to happen of we don’t agree on a joint effort there." U.S. plans for a missile shield have been a major irritant in its ties with Moscow since the Cold War. Now both Russia and the West are casting missile defense cooperation as a crucial ingredient in recipes to bring the former foes closer. As part of a campaign to ‘reset’ strained relations with Moscow, President Barack Obama last year scrapped Bush-era plans for a radar and interceptor missiles in eastern Europe that Russia said would be a major threat to its security. Russia has been far more accepting of Obama’s revised blueprint, which would involve shorter-range interceptors. But Putin suggested Russia would feel threatened if the United States pushes ahead without significant Russian input. The Kremlin warnings come amid uncertainty over U.S. Senate ratification of New START, a strategic nuclear arms limitation treaty signed by Obama and Medvedev in April and seen as the linchpin of improving relations.